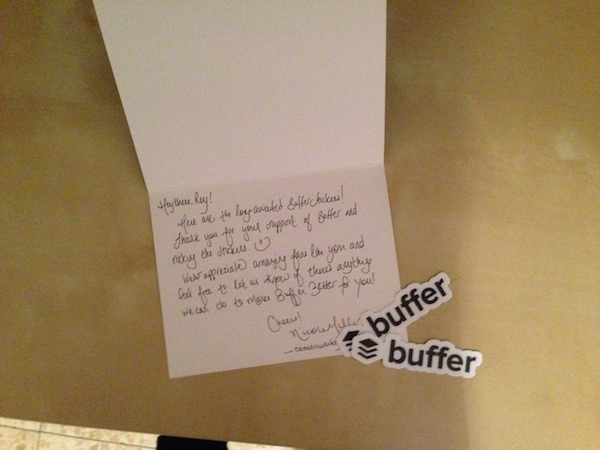 Are You Missing Out On These 3 Powerful Offline Referral Opportunities ? startups are aspiring to achieve. Having someone refer your product to a friend or colleague is the most valid test to know that your product is good and people love it. For new users, the “word to mouth” method is the best way to learn about new products. Getting recommendations from people they trust makes it easier for them to discover great products they know will work for them. Today I want to talk about 3 underused referral hacks targeted for your power users that most companies don’t utilize. To use Growth Hacking Jargon, the process of a user inviting new users into the platform is called a referral. The complete process that starts with the invite and ends up with a new signed up. A user inviting another user is called a Viral loop. Andrew Chen describes Viral Loops as: “The steps a user goes through between entering the site to inviting the next set of new users”. 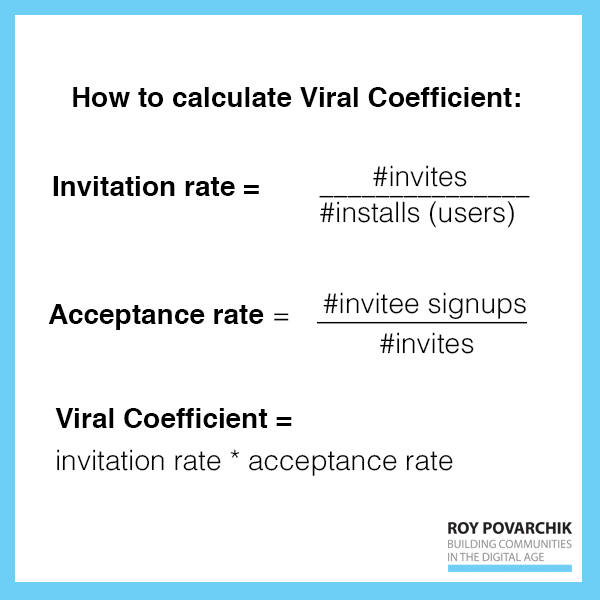 The metric to track a successful referral is called a Viral Coefficient and it represents the number of new costumers that each existing costumer is able to convert. Referral marketing works big time. Actually, Airbnb credit referrals for 30% of their growth. Just so you’d understand how powerful referrals can be. If you want to dig deeper into some of the trendiest ways to get referrals you can learn some hacks straight out of the Dropbox and Uber referral playbook or simply explore this 11 best practice for boosting referrals. Power users are the ones that try your product first, engage with you and send you feedback, mentions you on social networks, use your product often and are excited about getting better at using your product (for their own benefit of course). You should always encourage users to become better at what they do using your product. Customer service is a great way to turn users into evangelists. Quality, not quantity – At the beginning you probably won’t have tons of users, but a handful of committed ones. You can easily engage with them directly and encourage them to become power users. So you don’t need thousands of users, just a handful of passionate ones. Early adopters and thought leaders – Most of the time, if you have a good product, thought leaders and influencers in your niche will be among the first ones to try or test your new product. Just because they want to stay ahead of their competitors and know what new tools might help them to step their game. Getting a referral from an influencer can do a lot for your business. Good active users will be using your share buttons, click on the incentives etc. Power users will do a lot more and tapping into that “a lot more” is what I’m going to talk about in this next segment. Users who really love your product will show off their loyalty, if it’s embraced by your company it’s your job to embrace their passion and help them take it to the next level. If they are just ‘active users’ you can turn them into passionate users and if they already are power users, these 3 simple gestures can increase the amount of referrals they make by tens if not hundreds. These 3 tricks aren’t technological or costly at all. Their power comes from crossing the digital barrier into something much more powerful- the real physical world. 1. Stickers are always cool! If you visited the Silicon Valley lately, you probably noticed beautiful MacBook air’s covered with various startup stickers, almost like war medals on a jacket. Who puts stickers on their computers? People who either work for the company the sticker belongs to, or people who use the product passionately and believe using it says something about them. What kind of sticker will they actually put on their precious computers? really good looking ones or functional ones. What is a functional sticker? It’s a sticker that actually provides value. One of Evernote’s growth hacks is a great example of a functional sticker. Evernote’s service is based on people collecting things they see online and taking notes. This means people should use Evernote while in work-meetings which creates the uncomfortable feeling that you are not actually listening to the person in front of you but “doing stuff on your computer while they talk”. Evernote helped its users address this issue with their sticker – creating both a static referral (everyone knows this guy is using Evernote) and a clear benefit for its users, excusing them from apologizing for using their computer while on a meeting. 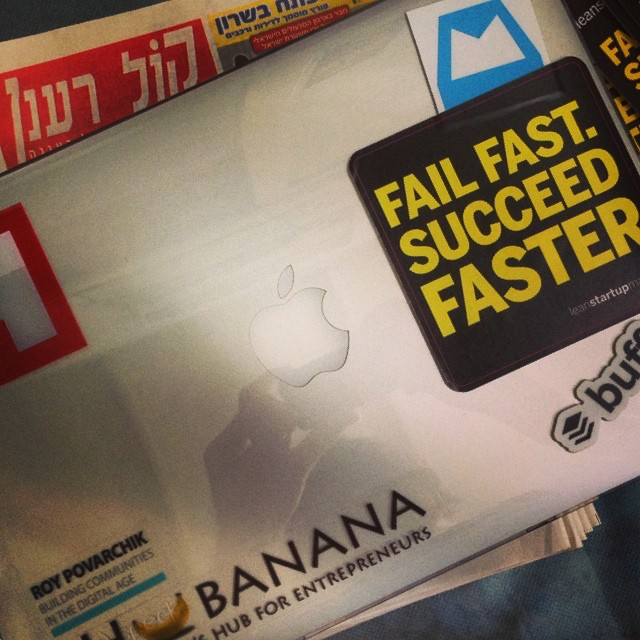 An example for a sticker you want to put on your computer because of its quality is Buffer’s sticker. Which is simply the company logo, but it’s made of very (very) high quality material. Most early adopters and power users are kind of geeks. I’m one so I can claim it out loud. I’m not talking necessarily about Steve Urkle geek (just revealed my age there…) but a tech geek. Everybody loves a good unique T-shirt. Hell, T-shirts are timeless. So be it, a 70’s vintage t-shirt, a live T-shirt from a Nine Inch Nails concert or a startup T-shirt. As long it is a great looking T-shirt, its gold. A few months ago, I started using Mixpanel for my clients. As a part of the process I contacted Mixpanel’s support team and asked them to train me to be a super user. I wanted to be a pro user of their product so I could give the best service possible for my clients. What make a startup T-shirt valuable toits users? Don’t emphasize the logo – Here’s the important lesson you can learn from Mixpanel about designing a T-shirt people will want to wear. It doesn’t say “Mixpanel” in huge letters, because most people won’t want to wear an advertisement. 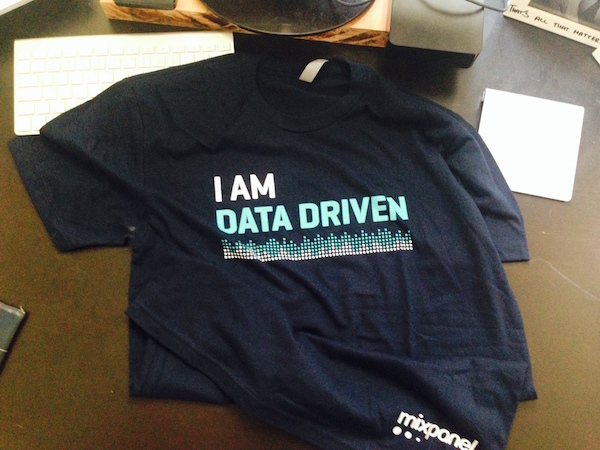 It says “I’m data driven” which resonates with their users target audience and if they can even be used as a trust element for me as someone who does growth hacking for startup as in “I’m so into this business that I even got a t-shirt for this product you’re now implanting for your startup’s analytics”. Quality T-shirt – Don’t send your customer low grade t-shirts. Give your customers T-shirts they can use for a long time and look really good in them. People want to wear beautiful t-shirts that project quality and not “the cheapest shirt I could get”. Give them a high quality memorabilia. Only big brands can pull a logo based T-shirt? Apple, Google, etc…Only huge brands that stand for something or brands that are perceived as luxurious can get away with that. Here’s an Apple T-shirt I got to prove it. 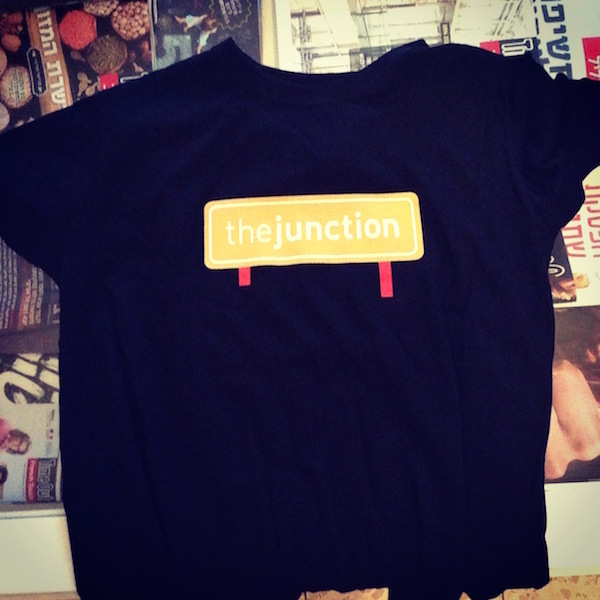 Memorabilia from my talk at The Junction. The more digital marketing has become, the more a personal touch has become powerful. Sure, you get personalized emails saying how awesome you are for joining a service, or a personal online coach to use a platform, but all that is not really personal. You know what is really personal? A handwritten note that’s written by a real human being. 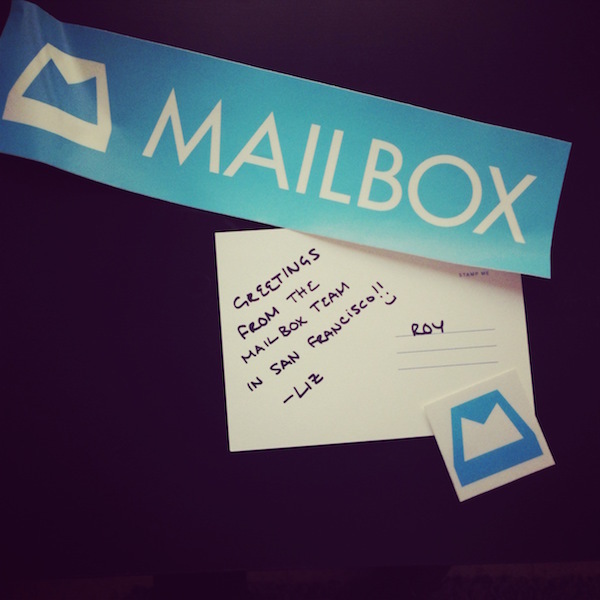 I’ve always been a big fan of Buffer, Mailbox and Flipboard. They are some of my favorite productivity apps. I use them daily, I recommend and use them for examples on my talks (and blog posts apparently). So you could say I’m a power user for these apps. 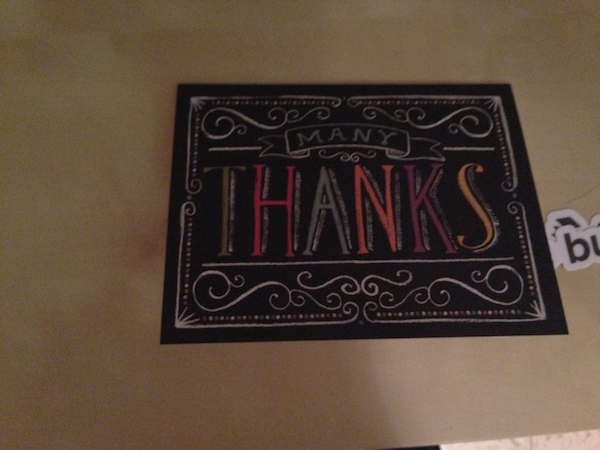 What makes personal “thank you” notes work so well as a referral incentive? They are hand written – Even if it’s a pre-made text, someone took the time to sit down and write a personal copy just for you. It is signed with a real person name – it’s not just “the team”. It’s Liz. Which makes it that much cooler and personal. They appreciate you as a user – It’s not a “we’re so cool” kind of thank you letter, it is one that appreciates your devotion and time spent on their product. It comes through regular old-fashion email – who the hell sends personal letter through regular mail? You only get bills and promo material right? Well, if you’re old enough to remember, there’s nothing that is more fun than getting a letter from a friend. With the hard copy thank you letter, they’ve just become a long lost friend who suddenly surprises you. And the surprise is always important. The first thing most of your users will do is to take a photo and share the letter they just got on Instagram and Twitter, saying good things about the product and the company for being so cool and attentive. Which is kind of the best referral you can get, right? A passionate user showing off how great you treat your users. Always show love to your most powerful users and give them the tools to show their love back! What are the most useful offline hack you’ve used to increase your company’s word to mouth?